The triskelion, also known as a triskele. An ancient symbol that consists of three bent arms that all radiate in rotation from a center point, it features heavily in Celtic art in one form or another. One of the most famous instances of the shape is where it is carved as a triple spiral into the huge stones that surround the Neolithic passage tomb at Newgrange, in Co. Meath, Ireland. It’s been ascribed many meanings over the years, from the Christian divine where it represents the holy trinity, to pagan meanings where the number three is held sacred, to representations of the three trimesters of pregnancy. I even hear that some consider it just a strange image dreamed up by ancient Irish carvers who’d been taking hallucinogens. Whatever its original meaning, it represents a symbol as essential to Ireland as the Celtic cross or the Claddagh. 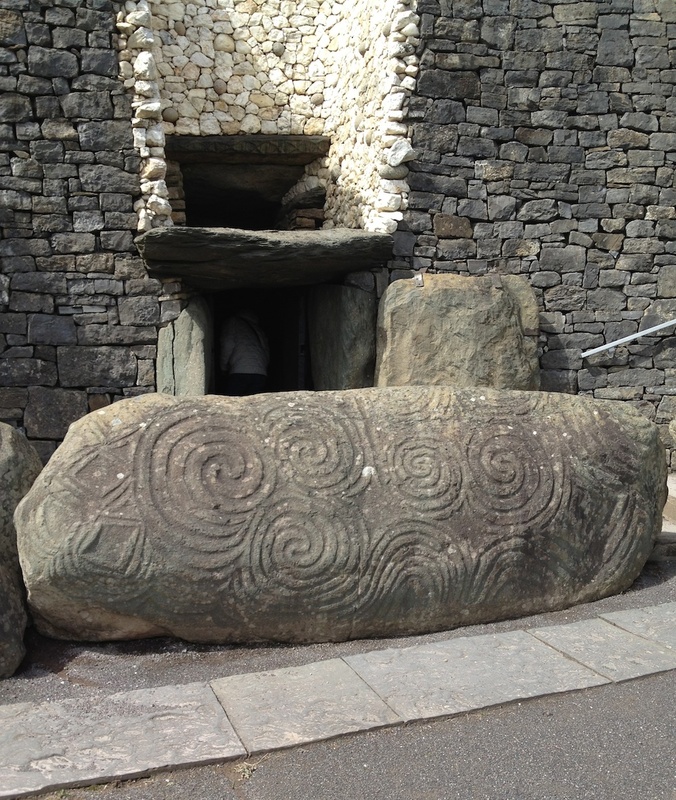 Here are three arms of the triple spiral that shapes The Druid Stone. They watched as the train tracks warped and bent, rearing up from the ground like the back of a snake and slapping down again. There was a horrible metallic creaking, like a car crash, and the tracks seemed to turn and curl, furling like a fiddlehead, the landscape melting and bending around them. He recognized it immediately: the arm of a triple spiral, and they were at its outermost—and simultaneously innermost—point. The scrutiny was cruel, but necessary. He spread his empty palms. Showed her his hands, smooth and free of calluses. It was no use lying to her; she’d see right through him, soon enough. But he needed this woman’s help. She knew the land, which this far in time was something foreign to him. He had to convince her she needed him too. He pulled up his sleeve, exposing the blue shape of the triple spiral nestled in the inside of his elbow. 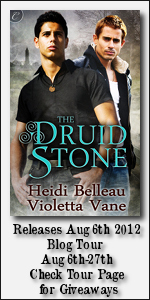 “I’m a druid,” he said, and it was a strange thing to say it so plainly and expect it to carry weight. “Longer than you know.” So much longer. “There’s one, near Loughrea. And the last point is under Galway.” Sean saw the triangle now, connecting the three points. Cormac, possessed by some fit of passion, snatched up a black marker and inked the triple spiral across the map, the innermost points of the furls located atop the three points Aoibheann had indicated. “I understand,” he said, and Sean could tell that his mind was working furiously, inexorably, to uncover the supernatural architecture. Sean never asked to be an O'Hara, and he didn't ask to be cursed by one either. After inheriting a hexed druid stone from his great-grandfather, Sean starts reliving another man's torture and death...every single night. And only one person can help. Cormac Kelly runs a paranormal investigation business and doesn't have time to deal with misinformed tourists like Sean. 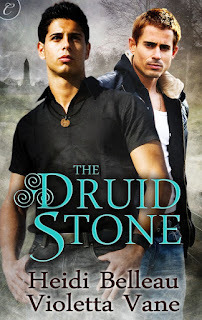 But Sean has real magic in his pocket, and even though Cormac is a descendant of legendary druids, he soon finds himself out of his depth...and not because Sean's the first man he's felt anything for in a long time. The pair develop an unexpected and intensely sexual bond, but are threatened at every turn when Sean's case attracts the unwelcome attention of the mad sidhe lords of ancient Ireland. When Sean and Cormac are thrust backward in time to Ireland's violent history—and their own dark pasts—they must work together to escape the curse and save their fragile relationship. Isn't that just the way it is? Hahaha. Fiddleheads are also delicious to eat!